Panoramic beach by day with a dreamy phenomenon at night! Uniqueness of this attraction Around 40 minutes away from the city of Miri, Tusan Beach has just recently exploded into popularity as an attraction here. Located in the small town of Berkenu, Tusan Beach was discovered to have the “blue tears” phenomenon on its sands in late 2015. The cinematic blue tears is caused by the bioluminescence of plankton organisms in the water when they are interrupted by oxygen to produce a stunning blue light. Think of Tusan Beach as a ‘secret’ paradise in your fairytale dreams! To enter the beach itself you have to navigate down a rough path from the top of the cliff. The long sandy beach makes it perfect for picnics, flying kites or just relaxing under the sun. The waters itself may be a bit rough for some and not suitable for swimming. Walking along the shore, you can find interesting rock formations like the horse head rock and unique geological features such as small caves. Benches are also set up at the top of the cliff to view the dramatic sunset. Golden skies and a perfect view of the sun make it an ideal opportunity to get some great pictures. Seashells also litter the beach and makes it a good day for a shell collectors. Other things to do here? If you are hungry, stop by the food stalls near carpark area. Also, there’s a place where you can swim in its calm and pristine waters nearby Tusan Beach. One thing you’ll notice is that the beach is extremely clean and that goes for the blue waters as well. The shore is a few kilometers long with lots of big trees on the coastline where you can enjoy the shade. Just be careful with the jellyfishes here! What to bring home? 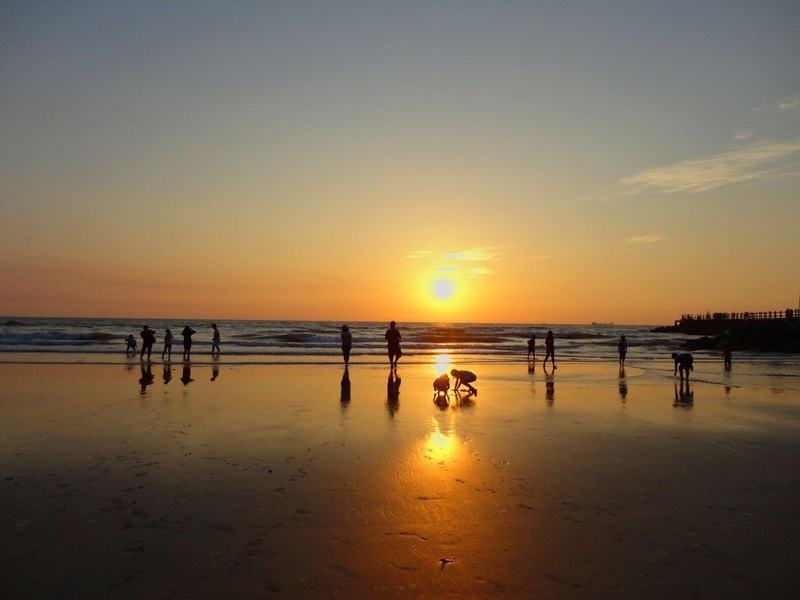 If you’re planning to visit Tusan Beach, be sure to carry your camera along with you as well. Aside from the famous blue luminescence beach at night and the natural formation of ‘blue tears’, Tusan is a stunning place for sunset photography and it’s views in general. You can spend hours snapping away at the huge cliffs and interesting rock formations. Getting around There is no direct way to reach Tusan Beach. By public transportation, you can opt to take a bus from Miri to Simpang Bekenu, for roughly an hour journey. From Simpang Bekenu Bus Stop, hire a local taxi to bring you to Tusan Beach. You may also hire a taxi from Miri to bring you all the way to Tusan Beach. However, this will be a pretty pricey option as you would also have to have the driver wait there for your return trip because it is difficult to find taxis at Tusan Beach. Another option would be to get a rental car at Miri and drive yourself to Tusan Beach. There is a car park located near the entrance. There are quite a bit of sand flies here so do bring plenty of insect repellant to protect yourself. Remember to apply before and after you enter the water. Tusan Beach is quiet and peaceful during the weekdays while the huge crowds throng in during weekends. Bring enough cash as there are not many facilities offered here. There is a basic toilet facility provided for you to shower after swimming. Tusan Beach is an ideal place for family outing or enjoy romantic picnics during low tides too! The best time to visit here is either in the morning, around 10am onwards or in the evening from 5pm onwards to witness the sunset. However, the waters might be rougher in the evening so remember to be careful if you are bringing your little ones! A magnificent stretch of sand and golden cliffs, Tusan Beach is as attractive as it gets during both day and night. There are no reviews on Tusan Beach. If you’ve been here before, write a review to share your experience.